La Mesa, March 13, 2016 – An important milestone was recently celebrated in the progress of the taxpayer-funded construction of a new Heart and Vascular (H&V) Center at Sharp Grossmont Hospital in La Mesa. While the three-story, 71,000-square-foot H&V building is scheduled for final completion later this year, construction was recently completed on the first phase of the project consisting of a new pharmacy and clinical testing laboratory on Level “A,” which is set to open in March to begin serving patients. 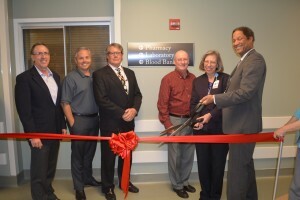 A ribbon-cutting dedication ceremony for the pharmacy and lab was held on Feb. 24. The H&V Center is part of renovation and modernization that’s been underway at the publicly-owned, 540-bed hospital since June 2006, when voters approved Proposition G, a $247 million bond measure sponsored by the Grossmont Healthcare District. GHD, a public agency that supports various health-related community programs and services in San Diego’s East County region, serves as landlord of the hospital’s property and buildings on behalf of taxpayers. Prop. G passed by more than 77 percent, well above the two-thirds required. The bond-financed construction began in 2007, and is scheduled to continue over the next few years. The hospital opened in 1955. The H&V Center’s new 6,700-square-foot pharmacy replaces the hospital’s existing 3,100-square-foot pharmacy, said Dr. Kenneth Schell, hospital pharmacy director. The previous pharmacy space will be used for other hospital purposes, including pathology work consisting of laboratory examination of body tissue samples for diagnostic or forensic purposes. Schell said the new pharmacy also features a retail operation so that all patients upon discharge from the hospital can get prescriptions filled at the hospital instead of an outside retail store. He also said the new pharmacy provides extra space for research studies for patients needing investigational drug therapies. In addition, the new 13,000-square-foot laboratory replaces the hospital’s existing 10,000-square-foot laboratory, said Chris Crawford, hospital laboratory director. However, blood draws will continue at the existing lab area, she said. Crawford said the new large refrigerator equipment with a capacity of 26,000 test tubes will permit the hospital to double the storage time of most specimens. “We are also excited about the new automation, robotics and auto-verification technology that will help our efficiency at inventory management,” she said. Completion of the building is scheduled for late-2016, followed by completion of the surgical floor scheduled for late 2018.The hospital is managed and operated by Sharp HealthCare under a lease agreement with GHD, which was extended by voters in 2014 for an additional 30 years. The Grossmont Healthcare District is an East County regional public agency that supports various health-related community programs and services in San Diego’s East County. Formed in 1952 to build and operate Grossmont Hospital, the District is governed by a five-member board of directors, each elected to four-year terms, who represent more than 500,000 people residing within the District’s 750 square miles. For more information about GHD, visit www.grossmonthealthcare.org. Sharp Grossmont Hospital has been serving the East County community for 60 years. It is the largest not-for-profit, full-service acute care hospital in San Diego’s East County and is part of Sharp HealthCare. The hospital is known for its clinical excellence in emergency and critical care; cardiac and cancer care; surgery; stroke care; orthopedics; rehabilitation; behavioral health; women’s and children’s health; and hospice care. The hospital offers extensive outpatient services and prevention programs such as home infusion, sleep disorder care, wound care and hyperbaric medicine to support Sharp HealthCare’s emphasis on community health and wellness. Sharp Grossmont is a Magnet-designated hospital and committed to providing the highest quality care. To learn more, visit www.sharp.com/grossmont, call 1-800-82-SHARP (1-800-827-4277) or follow us Facebook.